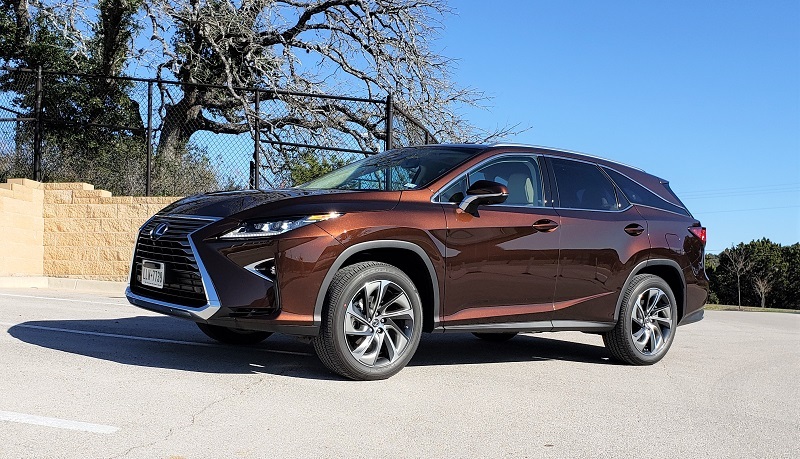 Lexus introduced a 3-row version of their popular two-row RX350 last year – offering Lexus RX customers a six or seven passenger option of the popular SUV – the RX350L. Lexus was very careful in creating the 3-row to not take away from any of the attributes of the 2-row. It was a simple modification actually. 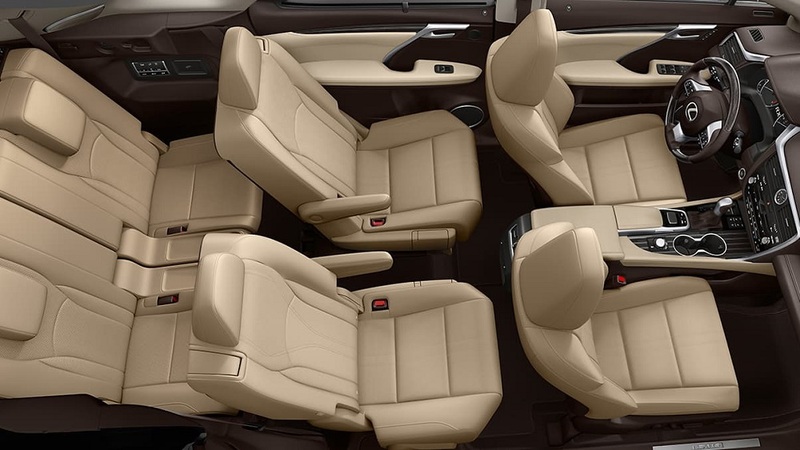 They added 4.3-inches to the rear of the 5-passenger version to allow a third row. By extending the roof line and taking the tailgate window more to the vertical, they were able to accommodate a two-seat row. 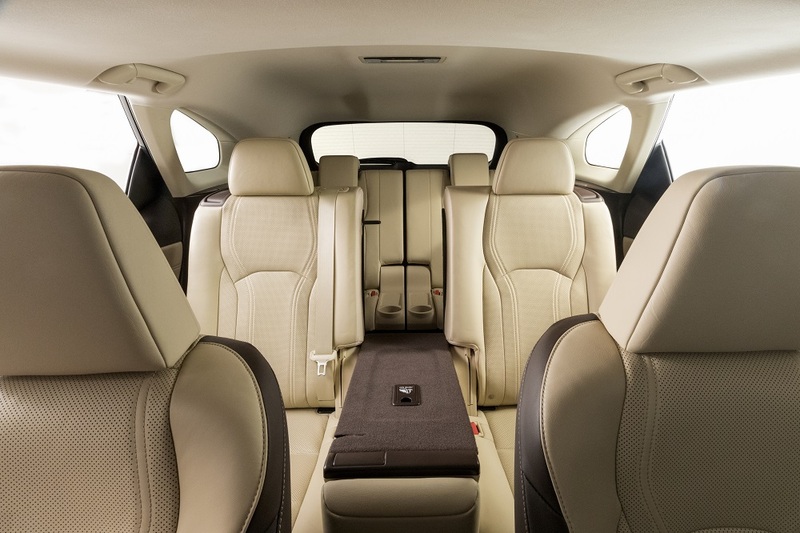 In anticipation of a test drive, we had concerns about head and legroom for more full-sized adults. The headroom is a bit short at just under 35-inches with legroom very questionable at 23.5-inches. But we found the seat row is mounted slightly higher than the second row which adds some ‘footwell’ room for those in the third row. Still a bit tight for us bigger folks, but workable. Other than that third row, the RX350L is the same as the RX350. 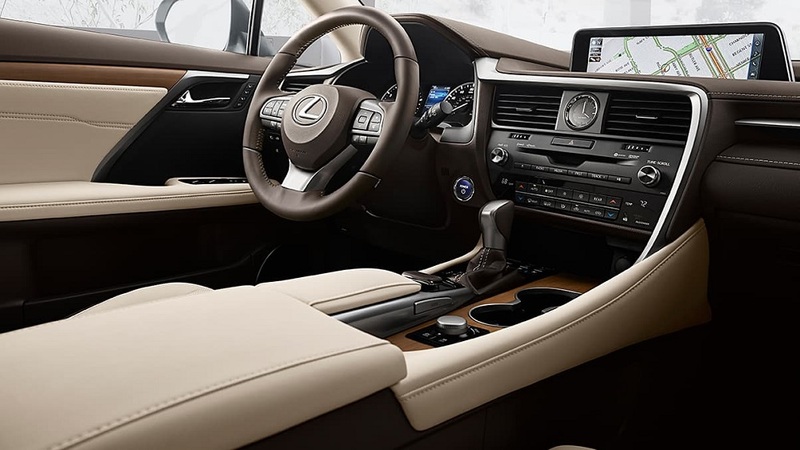 Powering the RX350L is the same 3.5L D-4S V6 with VVT-iW producing 290 horsepower with 263 lb.-ft. if torque. Performance is enhanced by an eight-speed automatic transmission and Drive Mode Select with three driving modes (Normal, Sport and Eco). 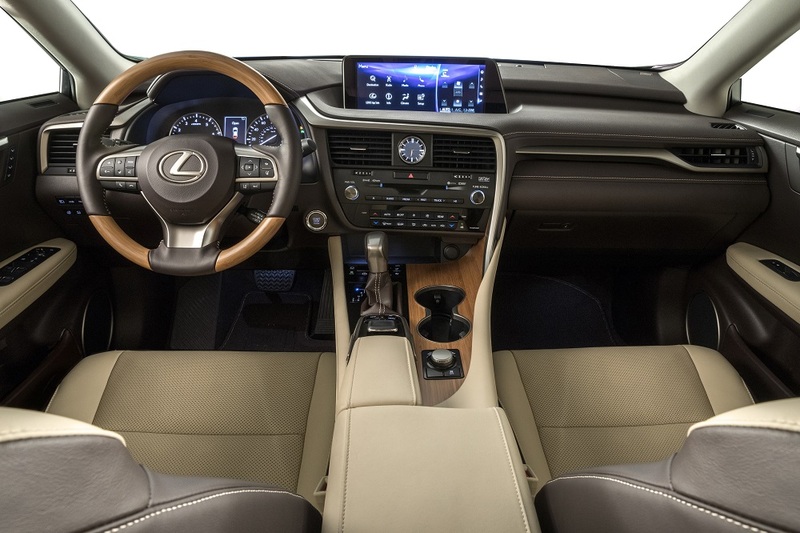 The RX350l also offers front-wheel drive (FWD) or the Lexus Dynamic Torque Control All-Wheel (AWD). The RX350L AWD normally runs in FWD for best fuel economy. Its Dynamic Torque Control system continuously monitors driving situations and, when accelerating or in challenging road conditions, engages – shifting torque to the rear wheels for added control. The fuel economy rating is 19/26 mpg city/highway and 22 mpg combined for FWD with the AWD about one mpg less. Delivering the same responsive and comfortable ride, the RX350L is equipped with a MacPherson strut and coil springs front with a rear double wishbone with coil springs suspension rear, rack and pinion Electric Power Steering and 12.9-inch ventilated disc front with 13.3-inch ventilated disk brakes rear. Standard wheels are 18-inch with 20-inch available. 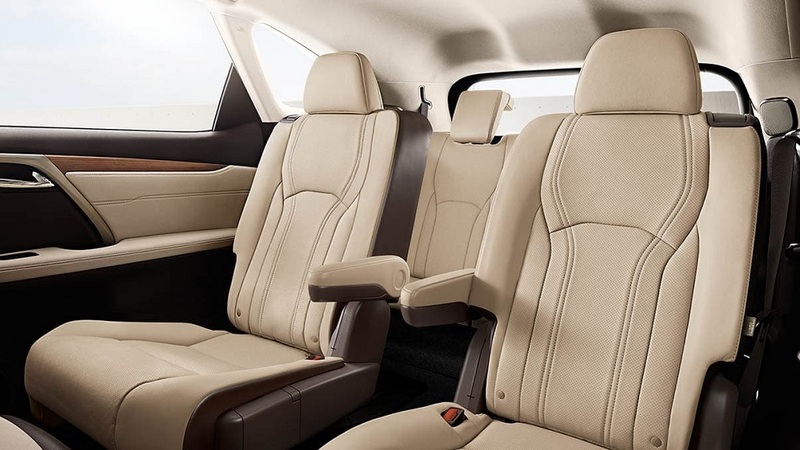 The standard version of the three-row RX350L is 7-passenger when fitted with a 40/20/40 second-row bench seat and slip and slide feature for easy access to the third row. 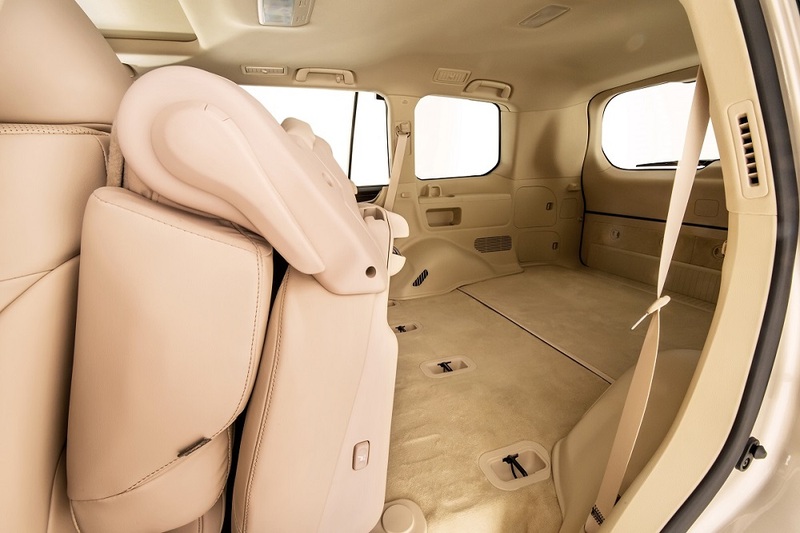 Optional captain’s chairs – with console – in the second row make it a 6-passenger. First and second rows are leather trimmed with front featuring heat and ventilation. The second row is heated. Third row passengers have their own A/C controls and cupholders. Cargo capacity with the third row up is a bit meager at 7.45 cubic feet. 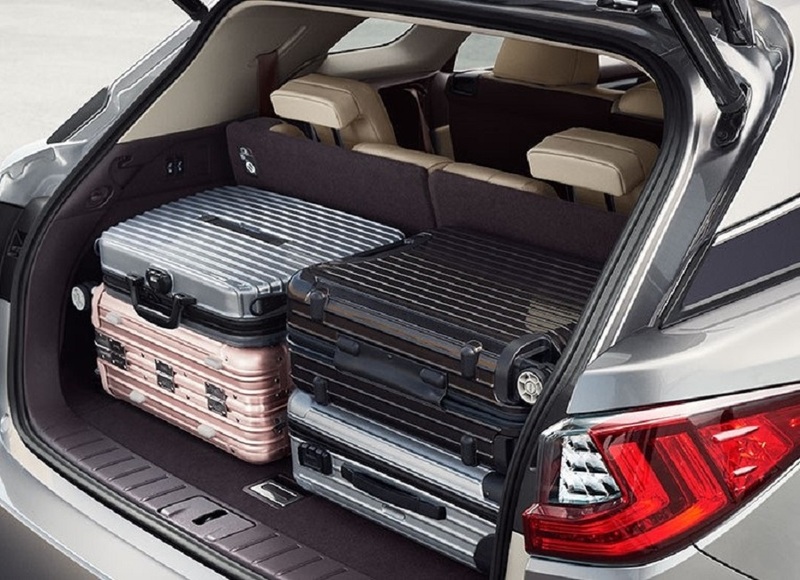 Powering the third row to flat, the cargo space increases to just over 23 cubic feet. 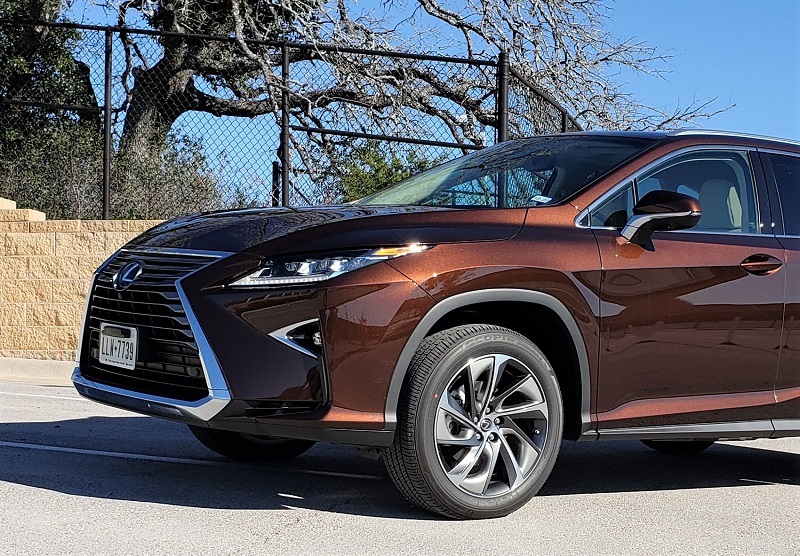 Exterior features of the RX350L also mimic the RX350 and include the signature Lexus spindle grille with chrome surround and standard Bi-LED headlights. Blacked out C-pillars create the same floating roof effect found on other Lexus models. The signature look continues to the rear with L-Shaped LED taillights framing the tailgate. 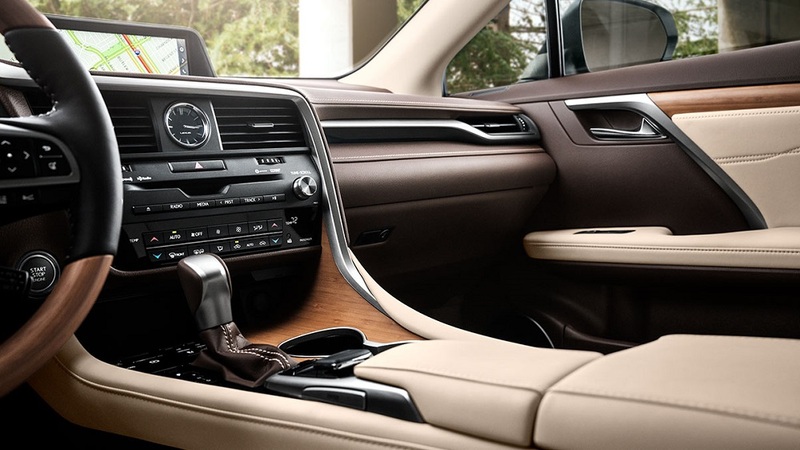 On the inside, you will see the same premium touches found in the RX350 including form-fitting seating, available wood accents like Bamboo and Walnut with Striated Black Trim and an available full-color Heads-Up Display. 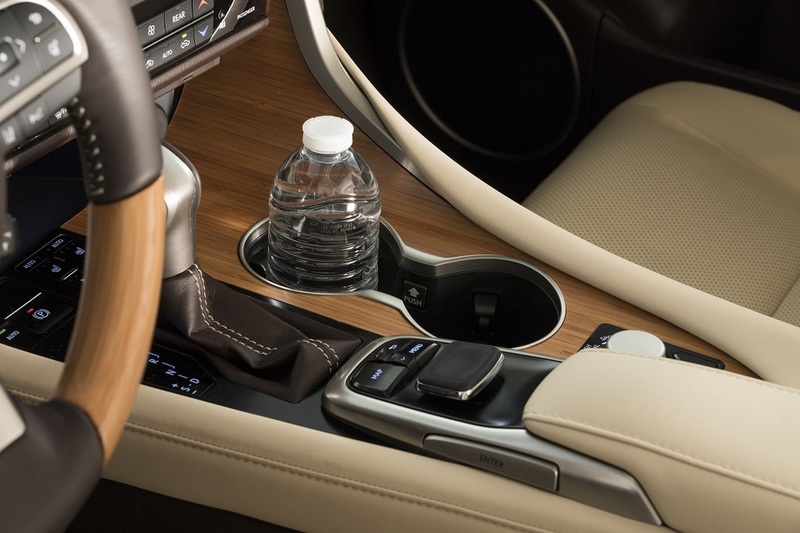 Also, standard is the Lexus Display Audio with eight-inch display screen, nine speakers, AUX jacks, USB ports and Remote Touch Interface. An available Navigation Package upgrades to a 12-speaker premium audio and a 12.3-inch high resolution multi-media display with split screen capability. For our test drive Lexus sent us a 2019 version of the RX350L – in AWD – for a weeklong drive test to see how well the third row works in the RX. It had a list price (MSRP) of $54,185. Outfitted with a Luxury Package, second row Captain’s Chairs, Triple-Beam LED self-leveling headlamps with washers and cornering lamps, Touch-Free Power Liftgate, Panoramic View Monitor and our favorite, the 12.3-inch Navigation/Mark Levinson 15-speaker Premium Audio Package, plus a whole lot more the delivered price was $63,485. How well does the 3-row version work? For those needing it on occasion or for a growing family, it will more than meet the need. As for us – retired, but still very active – we like the roomy Captains Chair seating and its amenities for our guests. Plus, with the extra length, we get a lot more gear aboard with the third row powered down. Some of the other features that made this test RX350L AWD a very nice ride included: Power Tilt/Slide Moonroof, 12-way Power Semi-Aniline leather trimmed front seats, premium laser-etched Gray Sapele Wood with Aluminum trim and accent interior, LED Illuminated Scuff Plates, LED Ambient Illumination, Rear door sunshades, SiriusXM Satellite Radio and Lexus Enform Remote with Smart Watch and Alexa integration. 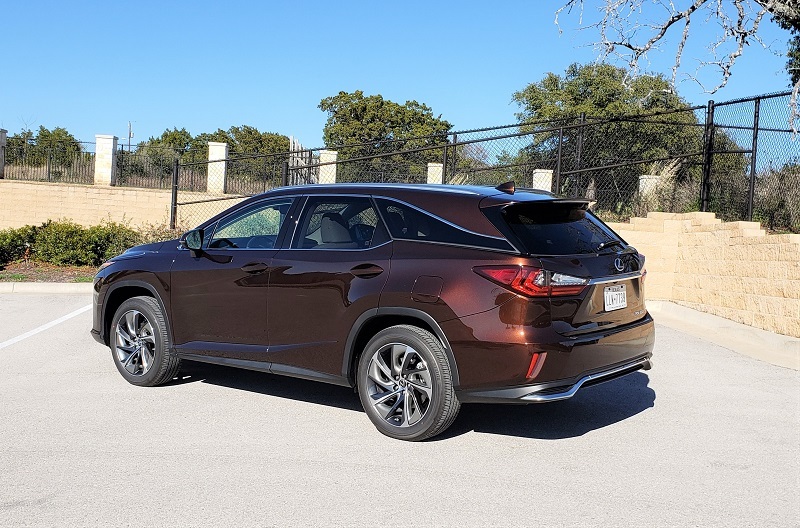 Also noted were the optional 20-inch Super Chrome Alloy Wheels with color inserts, Power-folding Heated Outside Mirrors, Rain-Sensing Wipers with De-Icer and the Lexus Safety System plus Specific Tire Pressure Monitoring, Blind Spot Monitor with Intuitive Park Assist and Auto Braking. As with the two-row hybrid RX450h AWD, there is also a hybrid three row available – RX450hL AWD. As a three-row (or two-row) it uses the same hybrid powertrain – 3.5L gasoline engine with two high torque electric drive motor-generators producing 308 total horsepower. 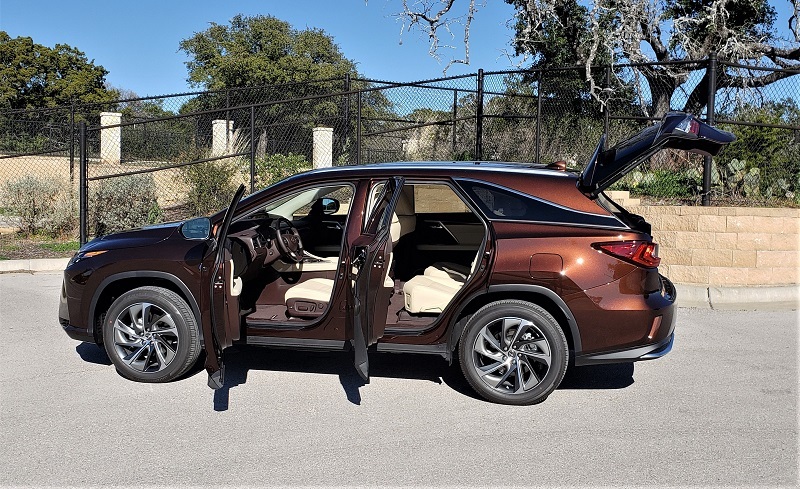 The standard AWD system – instead of using transfer gears and a drive shaft to the rear wheels like a RX350L AWD, the RX450hL AWD uses independent rear-mounted electric motors to drive the rear wheels when needed. The Drive Mode Select system on the RX450hL also has a fourth mode as compared to the RX350 L that enables the vehicle to run on full electric power – at low speed – for short distance.